Lauki ke parathe is mainly made of Lauki /doodhi [Bottle Gourd] and wheat flour. The mild taste of bottle gourd with a blend of green chillies, ginger, garlic, red chilly and turmeric gives unique flavour and pungent taste coming slowly one by one. You can have it with variety of dips like cucumber raita in breakfast or as Main course. 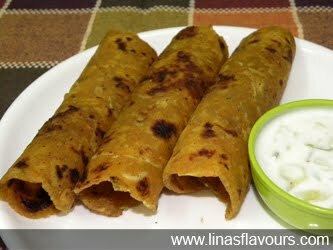 Take a bowl, add wheat flour, grated lauki, green chillies, ginger-garlic paste, red chilly powder, turmeric powder, lemon juice, salt, 2 tablespoon of oil and knead dough. Serve it hot with cucumber raita.